Product prices and availability are accurate as of 2019-03-23 08:01:00 EDT and are subject to change. Any price and availability information displayed on http://www.amazon.com/ at the time of purchase will apply to the purchase of this product. Extremely economical, it's no wonder our prefolds have been the go-to choice for years. An excellent value, you'll save money on disposable diapers, reduce your environmental footprint, and make a healthy and safe choice for your baby. Dandelion prefold diapers are 100% unbleached, organic cotton twill, certified organic to the Global Organic Textile Standard (GOTS) which is the highest standard of organics in the industry. These diaper service quality (DSQ) prefolds are available in traditional prefold dimensions which allow the diapers to be folded down in front or back, or twisted into a bikini fold. Also available are prefolds which offer a more modern cut; a bit wider and shorter than traditional prefolds. The more modern sizing of our Pinless Prefolds allow the diapers to be used with a Snappi fastener for a longer period of time, or simply tucked inside a diaper cover without a fastener at all (lay-in style). But don't let the name fool you; our pinless prefolds still work great with pins! Dandelion DSQ Prefolds are constructed with a triple panel design (extra layers in the center panel), reinforced stitching and extra soft organic cotton which needs only a single prep-wash before initial use (although they will become most absorbent after 3-5 washes). Dandelion organic cotton is not sprayed, treated or finished which results in a superior strength and allows the diapers to quilt and fluff up after only a few washes. Manufactured and sourced responsibly in Pakistan. 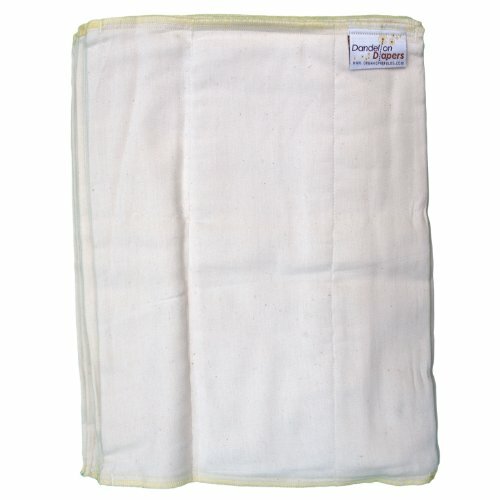 Helpful Hint: We've found many parents use these prefolds as high quality 100% organic cotton burp cloths!